As you guys read this, I will be in the Carolinas! I had a site visit in Easley, SC yesterday (Greenville area) and today I'm in Charlotte. I just love the Carolinas. For the longest time, I wanted to live in Atlanta because it is gorgeous and everyone is SO friendly. But then I visited Myrtle Beach and I realized it's very similar, people wise, to Atlanta except there's a beach! So I decided I'd retire in the Carolinas. I'd still have a house in St. Louis though for baseball season. Naturally. So, like I said yesterday, while I'm gone, you guys are getting outfits I wore a couple weeks ago but never posted until now. This outfit was easily thrown together because I swear anything + this skirt makes an outfit. Don't believe me? 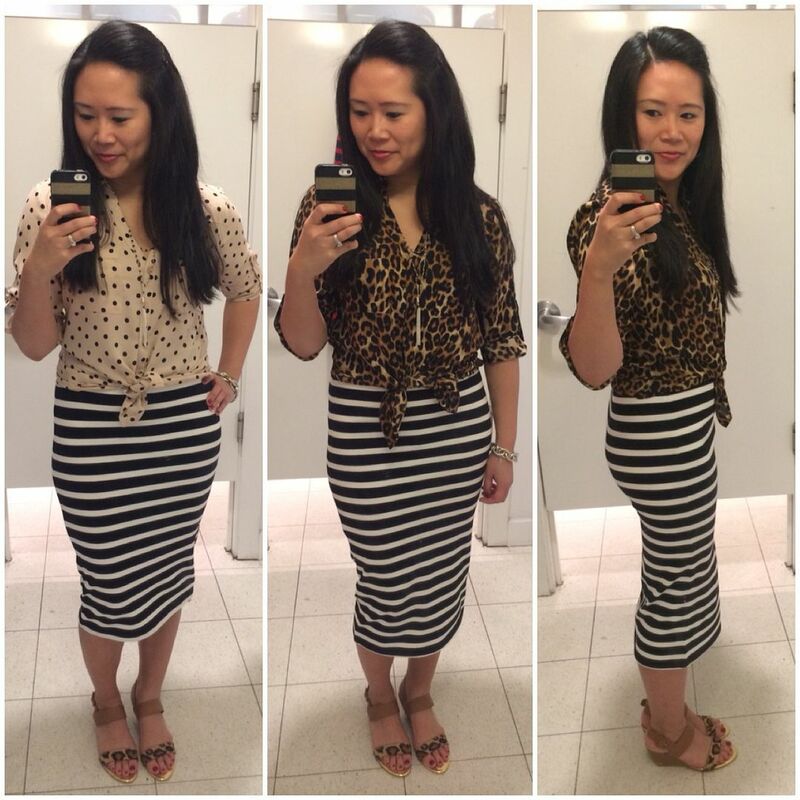 Unfortunately, my exact skirt is now gone from Express, but I was really happy to be able to find pretty good options for you guys (here, here, and here). And if you missed my guest post a few months ago when I talked about this skirt in more detail - you can get yourself caught up here. Thanks for reading and Happy Hump Day! Linking up for: What I Wore Wednesday, Random Wednesday, I Feel Pretty, Whatcha Wearin Wednesday, Thrift linkup. 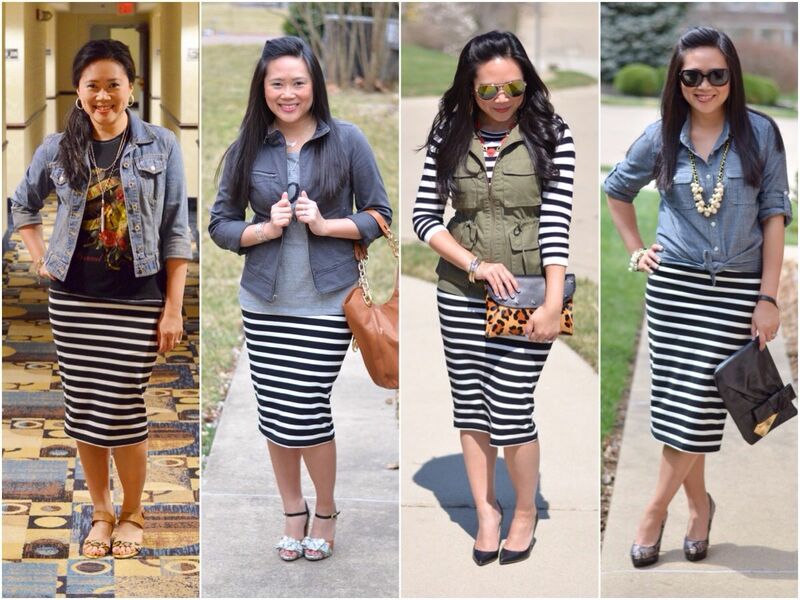 This skirt is so versatile, love all these looks. Thank you! I wish the skirt were still available! Have you ever seen the movie Shag? If not, you need to! Whenever I hear Myrtle Beach I think of that movie. I need to go there someday. On to the outfits!! I have missed that skirt and especially those HEELS. They are still one of my all time favorite pairs of yours. Ahahaha! This was so random but hilarious! Yes I have seen the movie and yes you need to go! One of my good friends is there and she is SO fun! Yes, I forget about these shoes - they need more air time! Ha! Love that we are on the same page! Oh my goodness, I would be wearing that skirt all the time, just like you. Love the various ways you have styled it, but this specific post, those shoes are really making the chambray and stripes quiet, stealing the show! Love how textured and awesome it all looks! Thanks so much, I am glad you liked it! Such a versatile skirt! Love all of these looks and especially today's with the wine heels! Thanks so much! The wine heels pair perfect with it, huh? Girl, you are WEARING that skir! I am definitely doing some style stealing on this post because I love it. I would truly love it if you can link up with us on Thrift Sisters as the purpose of the link up is to highlight thrifted items or thrifty priced pieces. 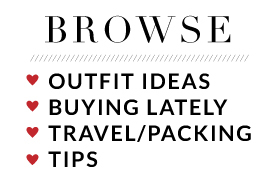 This post alone shows just how many outfits one can have without spending too much. You look gorgeous as ever and oh my! 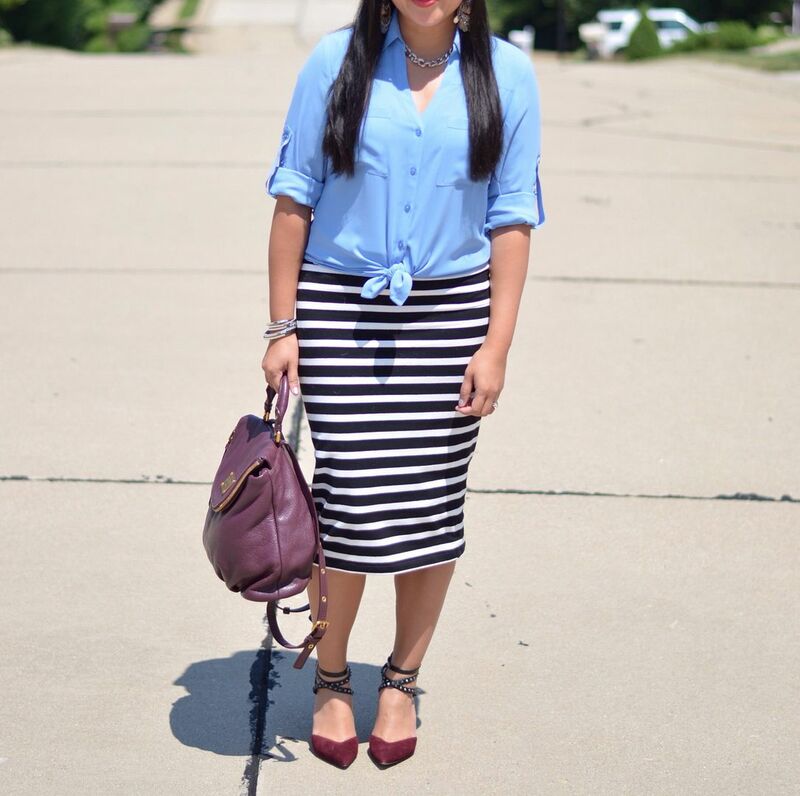 How versatile can a striped skirt be? You are creative and have a great sense of style! Thank you! That is such a nice thing to say! That skirt! Those shoes! I love black, white, and burgundy together! I thought so as well - love this combo! 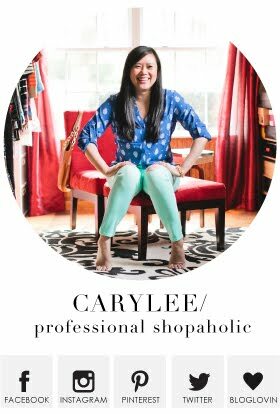 What do you do for work, Carylee? Are you a CRA? I just love the long striped skirt. And those shoes! You really do have the best collection of shoes and purses. I will be honest and say I don't know what a CRA is! But I work in real estate development/construction for a restaurant company! Our dress code is pretty relaxed, so I can get away with pretty much anything, which I love! I could not have seen this post at a better time. I was trying to find ways to remix a striped skirt I have for work. Love all your combinations. I'm going to replicate a few!! Yay! Happy to provide inspiration! Love everything about this look but especially the shoes- I need them in my life. Haha - yes, they are good ones for sure! Hopefully the bring this skirt back because I want it. The length is perfect. I had to pin those collages. =) And OMG are your pumps new? I love them. The heels unfortunately are not new. I got them last year at Nordstrom's anniversary sale! And yes, the skirt does need to make a comeback. I'm so glad I picked it up because I've already worn it so many times! It's great! love all those looks with that skirt! I keep meaning to get one, now I will get to it! Very cute! Have a great weekend! I hope you find your perfect one! Thanks for joining our link party! 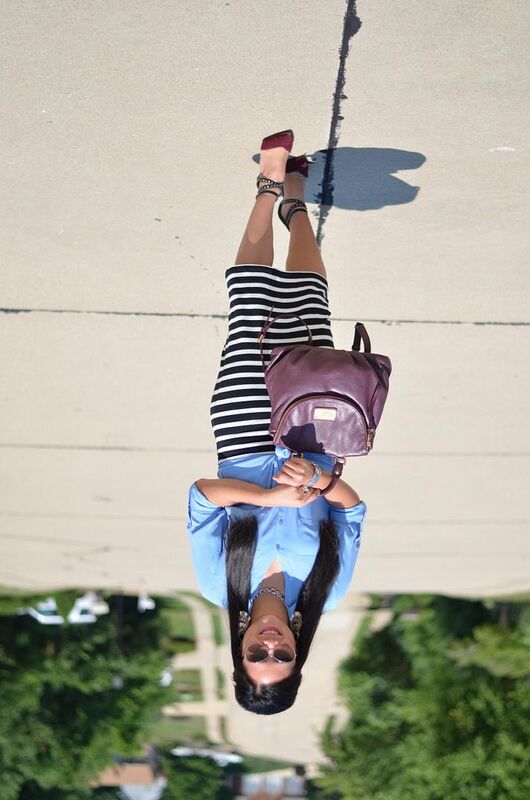 What a fun way to remix your skirt. You certainly came up with some fun looks. 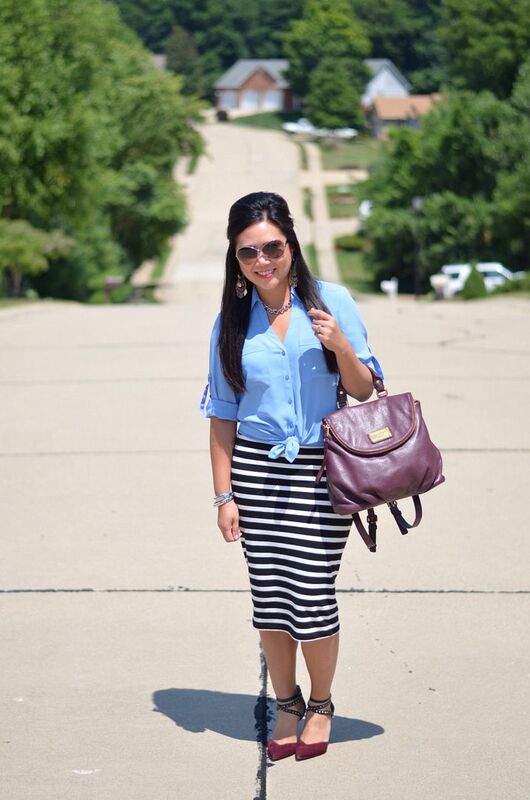 i love how you styled your striped skirt, you're reminding me of wearing mine! Thank you for linking up with us at Thrift Sisters. My pleasure - thanks for having me!